Left: Murtuza Mukhtarov and his wife Liza. 1912 to 1920: As the residence for Murtuza Mukhtarov and his wife Liza. Also it was used to house a boarding school for poverty-stricken or orphaned girls (about 1914-1920) organized by the first Female Muslim Philanthropic Society, which Liza established (1914). 1920 to present: After the Bolsheviks took control of Baku, a Woman's Club named in honor of Aliheydar Garayev was given the use of this building during the 1920s and 1930s. This group was involved in education and committed to the emancipation of Muslim women. Aliheydar Garayev was a Comissar (minister) in the Soviet government of Azerbaijan headed by Nariman Narimanov. He was one of the Azerbaijani Bolsheviks who gave the ultimatum for the parliament of the Azerbaijan Democratic Republic to relinquish all of its authority to the Bolsheviks in April 1920. Garayev was shot by Stalin in 1937. Later, the building was designated as "The Palace of Happiness" (Saadat Sarayi). Bridal couples registered their marriages and held wedding receptions there. Today, the building is less used for this purpose than during the Soviet period since numerous restaurants specializing in wedding receptions - "Palace of Joy" (Shadlig Sarayi) - have sprung up throughout the city. The Composers' Union also maintains administrative offices in this building on the ground floor, which can be accessed via the side entrance on Mukhtarov Street. This building, belonging to Oil Baron Murtuza Mukhtarov, is one of the largest mansions in the city and nearly occupies an entire city block. Despite being born into a poor family and not having access to formal education, Mukhtarov managed to become a highly-qualified, self-taught engineer, and one of the most reputable drilling experts in Baku. His enormous experience and shrewdness enabled him to set up his own business in 1890 when he founded what grew to become a substantial oil company. It had two divisions, employed approximately 2,500 workers and concentrated on manufacturing machinery for derricks and specializing in drilling oil wells. The Mukhtarovs were passionate travelers and toured throughout Europe. Once wife Liza expressed her delight in one of the French Gothic palaces, never dreaming that her husband would use it as a model to design a residence for her. The plans were acquired, modifications were made by Architect Joseph Ploshko, and the palace was constructed in Baku in 1911-1912. But a tragic accident took place while the palace was under construction. One of the contractors, Imran Gasimov, had gone up to the roof to adjust the statue of the medieval knight when he accidentally slipped and fell to his death. The following week his wife, Rubaba Khanim, committed suicide. 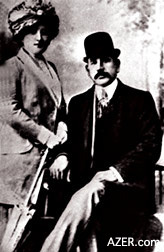 Having no children, the couple had devoted all their attention to each other and after her husband's tragic death, she took her own life, allegedly because she was so European in outlook that she realized that she would either have to leave Baku or begin wearing the chador, like other Muslim women did at the time. Being unable to leave, but yet unwilling to adhere to the restrictions in society, she took her own life - or so the story goes. Even today, the statue crowning the palace still stands, bearing witness to these two sad events [see photo]. Scaffolding is still in place around the tower today, though whether it dates back to this tragic event or not is not generally known. Another tragedy took place inside this mansion - this time, its roots were politically motivated. Shortly before the Bolsheviks' Red Army entered Baku in April 1920, Mukhtarov showed his disdain for them by declaring: "As long as I'm alive, no barbarian will enter my house in soldiers' boots." But soldiers did enter his palace and not only were they wearing their boots, but they rode horseback through the great halls. When Mukhtarov saw them, he fired first on them and afterwards, as the story goes, turned the gun on himself. Liza Khanim was forced to live in the basement of the palace, which had been built for her. Deprived of everything she owned, she eventually managed to escape with a diplomat to Istanbul where she lived until the mid-1950s. The Wedding Palace is open every day except Mondays and Thursdays. Regular hours: 10 am to 5 pm. Closed during lunch hours. When it's open and if a wedding event is not in session, you're likely to be able to enter and go up the grand staircase to the ornate central hall to catch a glimpse of the opulence and grandeur of the Oil Baron period. It's awesome view is worth the effort.